The Department of Otolaryngology-Head and Neck Surgery at the University of Virginia has a diverse and robust research portfolio, including basic science, translational, and clinical research. 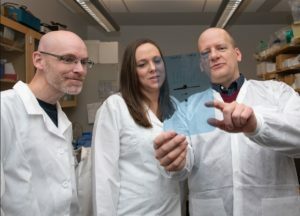 Our basic science and translational investigations include targeted molecular therapy in head and neck cancer, mechanistic features of hearing loss, methodologies to improve wound healing, development of novel biomaterials for tissue engineered reconstruction, and the study of smell dysfunction. Our clinical research is focused around the patient experience in every aspect of otolaryngology, including retrospective studies of patient outcomes, prospective clinical trials, improvements to medical education, and evaluations of new medical devices. Our residents conduct impactful studies and are successful in obtaining grants from a variety of national organizations. Our faculty are involved in solo and collaborative team projects that have garnered funding at every level, from internal seed grants to national-level extramural funding. The department’s commitment to meaningful research at every level allows us to be at the forefront of discovery and treatment for our patients.